While it may be true that Indo Lanka diplomatic relations are, in a broad sense, on an even keel at the present time, one issue that continues to 'rock the boat' is that of fishing activity in the waters that divide the two states. The efforts to arrive at a 'Memorandum of Understanding on Development and Cooperation in the field of Fisheries' have not been concluded to the satisfaction of either party. A Joint Statement issued by the governments of India and Sri Lanka after a meeting of the Joint Working Group on Fisheries - that preceded the recent visit to Sri Lanka by Indian External Affairs Minister S. M. Krishna - referred to many points on which "both sides" agreed. But the most conspicuous sentence in it refers to a one sided assertion by Sri Lanka: "The need to respect the International Maritime Boundary Line (IMBL) was stressed by the Sri Lankan side." On the IMBL issue, the silence on the Indian side is deafening. The clashes between Tamil Nadu fishermen and their Sri Lankan counterparts operating in the Palk Strait and Gulf of Mannar area have been frequently reported since the end of the war, when restrictions on fishing in the Northern seas were lifted by Sri Lankan authorities. There have been constant reports of fishermen from either side being arrested in each others' territorial waters and jailed for weeks, months, and in some cases even over a year, until their release following governmental intervention. However, there is no symmetry in this equation. Given the size of Tamil Nadu state and its population vis-a-vis that of Sri Lanka, the numbers of fishermen and boats involved on the Indian side far outweigh those of its small neighbour. The scale of operations too is not comparable. The Indians are believed to have more than 5000 trawlers and use sophisticated hi-tech fishing gear compared to the small fleet of multi day fishing boats used by the Sri Lankans. There is no level playing field here. When the Tamil Nadu fleet crosses the International Maritime Boundary Line that demarcates the common border, on a regular basis as it has been observed, they are no match for their Sri Lankan counterparts. Reports of arrests of the intruders by the Sri Lankan Navy, that patrols these territorial waters, have been on the rise. 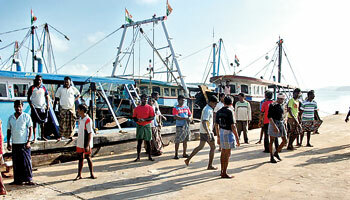 SLN sources say instances of Sri Lankan fishermen crossing the IMBL into Indian waters are far less. To make matters worse, Sri Lankan fishermen complain, the Indians use fishing methods that devastate the marine resources and destroy the fragile eco system. The method known as "pair trawling" involves two boats using drag nets that sweep the ocean bed, with drastic consequences. Leaders of Sri Lankan fisher societies claim that these methods have depleted fish stocks to such an extent in Indian waters that Indian fishermen now invade Sri Lanka's Northern seas in search of catch. Such is the situation now, they say, that when the Indian boats are spotted -- three days of the week -- Jaffna fishermen are unable to go to sea since clashes are inevitable. The poaching has now spread to the Eastern waters as well. The Indian position as agreed to by Sri Lanka in the Joint Statement on fisheries that "the use of force could not be justified under any circumstances" and asserting "the importance of extending humane treatment to all fishermen" is well and good. So is the pledge towards "cooperation that would allow both countries to pursue their fishing activity in a safe, secure and sustainable manner, including discouraging fishermen from using destructive fishing methods." "Where the coasts of two States are opposite or adjacent to each other, neither of the two States is entitled, failing agreement between them to the contrary, to extend its territorial sea beyond the median line every point of which is equidistant from the nearest points on the baselines from which the breadth of the territorial seas of each of the two States is measured. The above provision does not apply, however, where it is necessary by reason of historic title or other special circumstances to delimit the territorial seas of the two States in a way which is at variance therewith." The actions of those seeking to gain political mileage over this issue in Tamil Nadu, and the media hype in that state, are not helpful either. A recent report in the Chennai based "Hindu" falsely alleged that the SLN had attacked a group of Indian fishermen, injuring one of them and damaging their boats and gear. It turned out that what had actually happened was that the two trawlers that ran into engine trouble were rescued by the SLN near Katchativu island. The SLN had towed them to Talaimannar Naval Base, repaired the boats and escorted the men to the IMBL where they were handed over to the Indian Coast Guard. The Indian fishermen appeared on Sri Lankan TV to say that they were treated well. On different occasions in recent times, visiting Indian diplomats and dignitaries have hinted at the possibility of creating some sort of "common fishing ground" that would give fishermen from both sides free access to each other's territorial waters. Former Indian President Abdul Kalam's idea, mooted during his recent visit, that Indian fishermen have exclusive access to the seas on three days of the week, and Sri Lankan fishermen have exclusive access on three other days, with one day reserved for rest, was one such suggestion. Another such idea was hinted at by former Indian ambassador Shyam Saran, in response to a question on fishing following a talk at the Bandaranaike Centre for International Studies some months ago. He described it as "An open but regulated fishing regime," but with strong controls, for example on "size of the boat" and "size of the catch." He did not mention "size of the fleet." The Indian argument for 'free access' is disingenuous, given the considerable disparities of scale in the operations of Sri Lankan and Indian fishermen. To be fair, any Memorandum of Understanding on Fisheries would need to take into account, and compensate for, the very obvious reality that Sri Lanka can never match India's might in industry.